Order your own copy of Horrific Journeys at your local retailer or online through our website today! To protect your city, you must leave it behind. In Horrific Journeys, you and your team of investigations are tasked with solving three eldritch mysteries—aboard a bustling transatlantic airship, a luxury ocean liner, and a scenic countryside train. You will contend with cultists, hideous amphibian monsters, and even interdimensional creatures tearing holes in the fabric of reality in three brand-new scenarios that will challenge you like never before. 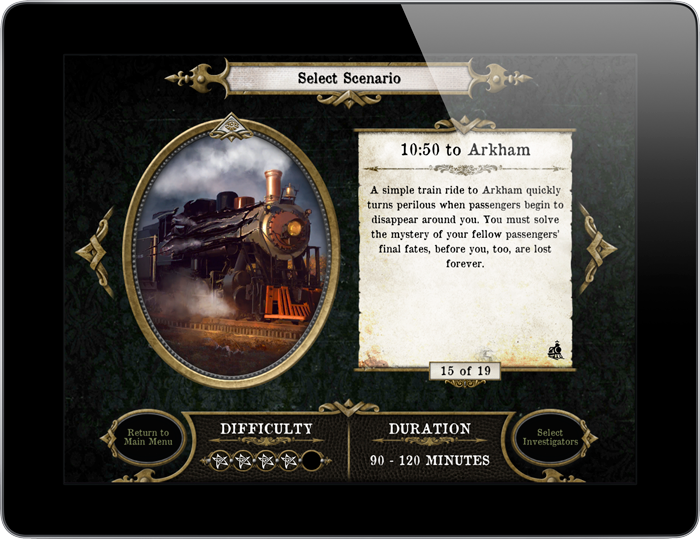 In the first of three scenarios, a simple train ride to Arkham quickly turns perilous when passengers begin to disappear! You must solve the mystery of your fellow passengers’ final fates before you, too, are lost forever. But before you climb aboard, we invite you to take a closer look at the thrills and the dangers ahead. 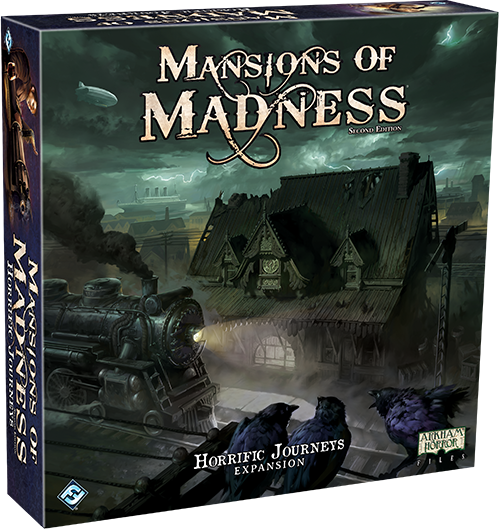 Today, we're pleased to offer you a preview of the 10:50 to Arkham scenario from the Horrific Journeys expansion for Mansions of Madness—now available for pre-order at your local retailer or online through our website! Steam hisses and metal creaks as the 10:50 to Arkham lumbers out of the station. Shadows grow long and the sun’s light fades as the train winds through the New England countryside. Your most recent investigation has left you a bit rattled, but your friend and fellow investigator Harriet seems to be particularly on edge. As you sit down to supper in the dining car, she keeps looking over her shoulder despite the car being mostly empty. You try to ignore her odd behavior, chalking it up to frayed nerves, but she soon pulls out her journal and begins outlining a wild conspiracy theory. She insists that there is some strange force at work and, pointing to several other passengers in the dining car, claims that this force connects both you and the people on this specific train. Harriet is not usually one for mad theories, so this shift in her demeanor is particularly alarming. You reach out, attempting to calm your friend and ask her what exactly is going on. But just as you do, the lights in the train flicker out. When they return a moment later, Harriet has disappeared! Now, one friend short, you must put the pieces together to figure out what exactly happened to Harriet and what connects her, and you, to your fellow passengers. Was she taken? Did she run? She can’t be far—there are only so many cars on this train. She can’t have just vanished into thin air… right? 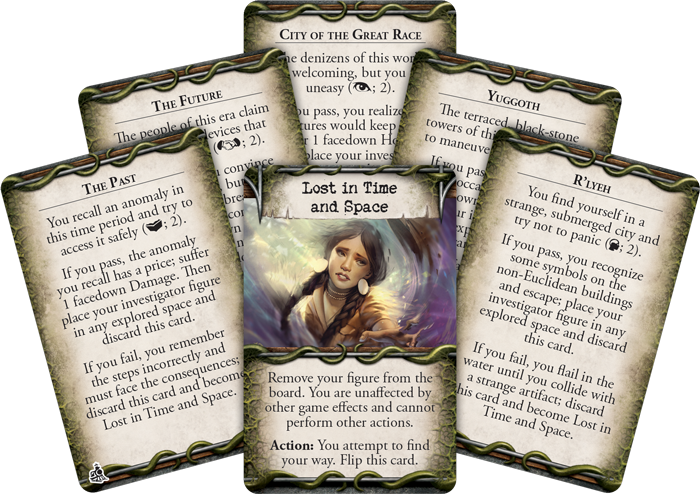 If you climb aboard the 10:50 to Arkham, you cannot be sure that the sleepy town in the Miskatonic River Valley will be your final destination.This scenario introduces a new mechanic to Mansions of Madness Second Edition in the form of rifts. 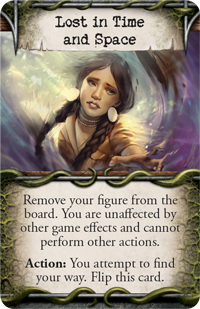 These new tokens represent weakness in the barriers of reality, which you must be careful to either evade or close, lest you be sucked in and disappear from this dimension. As an action, you may attempt to close a rift by testing your lore. If you succeed, you may discard the rift, saving both you and your team members from a terrible fate. But if you fail or perform any action in a rift’s space other than moving, you will become Lost in Time and Space. 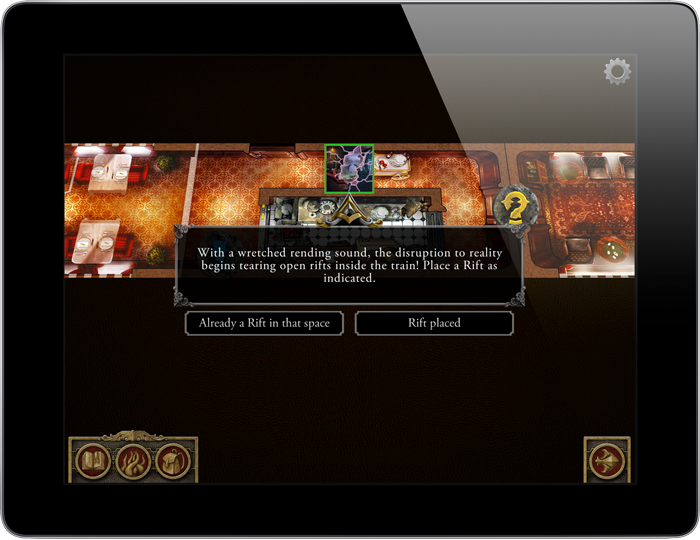 If this happens, your investigator is removed from the board! No one can come save you, and there is no telling where or when you will end up. You may find yourself journeying to the future, the past, or another world entirely. The only hope of finding your way back is to test your skills against your new environment. You may need recall a location’s history or ask for help from the people around you. But in any case, you cannot allow yourself to panic. The people of Arkham need you. You cannot abandon them now! Is Harriet’s theory correct? Is there some force uniting you with strangers aboard the 10:50 to Arkham? The only way to find out is to pack your bags and board the train. You may not know where the journey will lead you, but that is how the greatest adventures begin! Pre-order your copy of Horrific Journeys (MAD27) at your local retailer today or online through the Fantasy Flight Games website here!